International Journal of Research in Health Sciences,2014,2,1,9-19. 1Public Health Directorate, Jeddah Health Affairs, P. O 34496. Jeddah 21468, Kingdom of Saudi Arabia. 2King Abdul- Aziz Medical Centre, National Guard Hospital, Riyadh, Kingdom of Saudi Arabia. Background: Worldwide, the annual number of people killed in road traffic crashes is estimated at almost 1.2 million. (MVA) in Sudan is one of the major health concern and even a nightmare in some areas of the country where single twodirection high ways cross residential areas. Method: This is a cross-sectional study in which 621 of victims alive or dead attended and/or referred to Khartoum Teaching Hospital from October 2010 to December 2010.they were interviewed and followed till they discharged. Results: Most of involved victims were males aging 25 years and above. Driver mistakes accounted 505 (91.3%) of all accidents. Near two third of patients recovered completely, 195 victims recovered with disabilities, and 29 victims died at hospital. Pedestrians had large number of accidents. Discussion: Over speeding remains the main cause of accidents resulting in severe injuries with disabilities. Most of victims had educational level of primary school or even illiterate. Victims with severe trauma were 20 times higher risk of developing disabilities compared to mild trauma cases. Conclusion: Motor vehicle accidents in Sudan result in a significantly high mortality and morbidity rates that necessitate safety protocol including public health education, enforcing strict traffic and speeding rules, giving pedestrian priority in crossing rood, improvement of pre- and post-hospital trauma care in terms of welltrained emergency care technicians and well prepared ambulance. 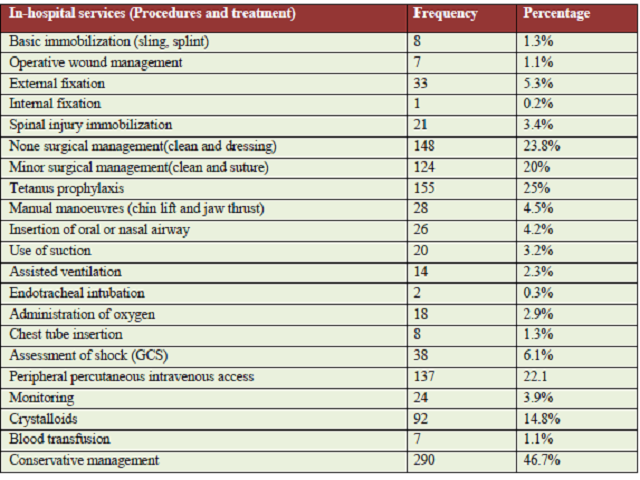 Most of patients did not wear any type of safety measures so legislations should be enforced. Appropriate management of road casualties following accidents is a crucial.